fter joining the Air Force to earn money for college, Amy Buchheit ended up serving in Desert Shield/Desert Storm, earning several awards and renewing her love for marine life. Now, while residing with her husband in Vancouver, Wash., Amy has a long to-do list that includes working toward a bachelor's degree in fine arts, traveling to Kauai, Germany, Honduras and Australia, and learning scuba so she can dive and discuss art with one of her favorite artists, Wyland. Inspired by Australian Aborigine art and creation myths, Amy Buchheit's abstracts focus on color, shape and texture. "According to these myths, known as Dreamtime," she said, "the creator beings  those who created man, the land and everything else on Earth  were believed to have come from the sea. "This, along with the fact that I've had an interest in sea creatures since high school, create a strong pull for me to create marine-inspired art." 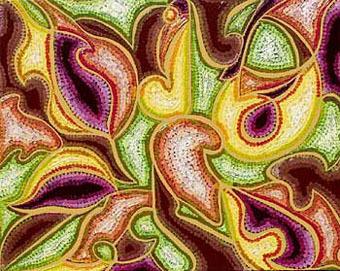 Amy's other abstracts, done in the same style, are also based on the spirit of the Dreamtime. More often than not, they're an expression of the spirit itself, or of the powerful forces of creation. Her painting, "Life Force," is an example. "From the center of the piece and in the midst of what may at first appear to be chaos, distinctive shapes appear," she said. "The line that moves throughout the piece is painted in a deep crimson, representing the life's blood of all living beings. 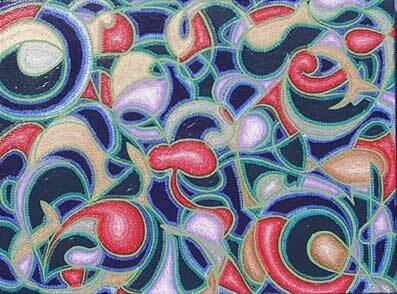 "The dot patterns found in this and all my current work is representative of the molecules that are in all matter. Thus, this piece is one that is visually recreating the idea of creation." With planning, prep work and an average of 10 layers of paint before the dots are added, it takes Amy approximately 100 hours to complete each piece. "Life Force" took 180 hours. "After choosing a canvas size, I use sketch paper to map out the design," she said, "first placing key elements, then adding a background that connects the defining lines of each shape and carries the eye throughout the work. 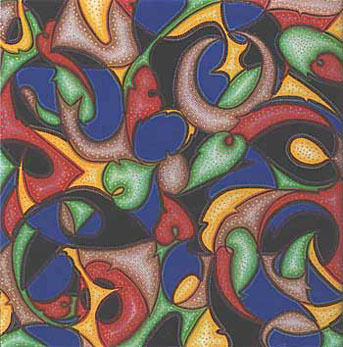 "This can be accomplished by using a technique where I scribble lines on the page and then pull out shapes by erasing extraneous lines. 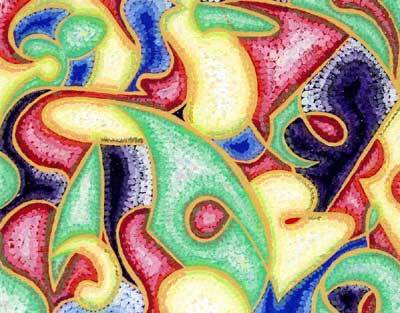 Another way is by drawing in abstract shapes that fit the theme of the piece." Once complete, she creates a grid over the sketch and another on the canvas itself. She then transfers the image from the sketch to the canvas by redrawing the image, section by section. Deciding on colors can take several hours. A single change on the palette can make or break the completed work. 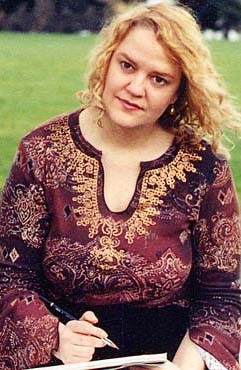 Amy was drawn to the art and beliefs of the Australian Aborigines while taking an art history class. "I had to do a paper on the art of ancient cultures," she said, "and was intrigued and fascinated by these people, the oldest continuous culture in the world. "I'm inspired by their rich sense of history and how spirituality permeates their being. 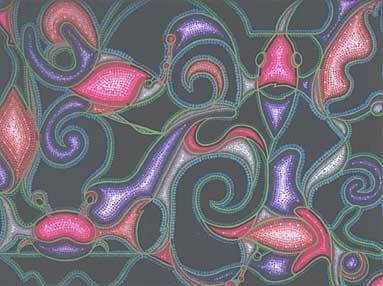 I'm also drawn to their use of dot painting as a means to create a visual vibration and interest within the work. 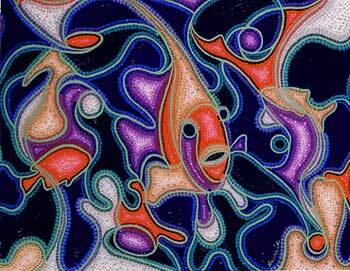 Their use of flat shape, pointillism and natural elements is very influential in my work." Color, texture and movement also inspire Amy's current style. A bit of fantasy and whimsy sometimes sneak in as well. Amy's favorite artists are Wyland, Patrick Nagel and Marc Chagall  she believes they all influence her work to some degree. "Wyland is influential because of his marine art, which I am favoring as a subject for my abstracted realism  or realized abstraction, however you want to look at it," she said. "I'm drawn to Patrick Nagel because of the flat shapes he favored, and Chagall because of his flat shapes and scattered subject matter." Amy's art has been used on T-shirts, flyers, posters and a yearbook cover. It's also been published in magazines and written about in local newspapers. Her painting "Sushi, Anyone?" made its New York debut last month at the Limner Gallery, while "Autumn Dreaming" was exhibited in a juried show at Soho20 Chelsea Gallery. "I'm really excited by the opportunity to exhibit in Manhattan," she said. "I recently made a commitment to break into the New York art scene and am thrilled to have received an opportunity so quickly!" Amy's creative talent surfaced early; at only 18 months she drew a boat. "Although the lines didn't all connect and it wasn't perfect realism, dad said you could tell what it was supposed to be," she said. "Unfortunately, the drawing was destroyed in his last move." By age three, Amy had announced that she was going to be an artist when she grew up. She began taking art classes in junior high and high school. Amy wanted to head straight to college but kept bumping into the realities of living on her own, as well as not qualifying for financial aid. Unable to find employment outside the fast-food industry in Spokane, Wash., Amy moved to Sandpoint, Idaho, where she still ended up working as a waitress. "The restaurant closed within three months and we didn't receive our final paycheck," she said. "Broke, but with a job lined up waiting tables, I moved to Portland for the first time. "After eight more months of waitressing, I asked myself, 'Is this what I want to do with my life? What DO I want to do?' I knew the answer to the first was NO, so I decided to join the Air Force for four years to gain some job skills and earn money for college." One temporary-duty assignment took Amy to Honduras. While there, she went on a four-day leave to the island of Roatan. "It's a beautiful, tropical island," she said. "I went sea kayaking and snorkeling for the first time, and swam with dolphins  an experience I'll never forget! It helped to reaffirm my interest in all things aquatic." While in the military, Amy stopped producing art, settling for crafts and painting ceramics. "I had more or less given up on being a 'real' artist, having heard so many times 'you can't make a living doing that.'" After a divorce and a trip to Alaska, Amy was again seized by the urge to create and to be an artist. She showed some of the work she'd created over the years and was hooked. "It was clear that I would not be happy doing anything else," she said. "So in '97 I started working on my bachelor of fine arts degree. Unfortunately, I also started getting ill and was so sick by the spring of 2000 that my doctor told me I needed to take a hiatus from school." Amy took a break from college, but not from art; she taught herself how to paint with acrylics. "I worked on developing a style and started showing again. I could do this on my own schedule, when I felt well enough," she said. "I've been showing my work ever since. "Although my path took many twists and turns, I'm thrilled to finally be doing what I love!" Amy's dream is to become well known and make a living with her art. She took a big step toward that goal with her recent shows in New York. Internationally she's aiming for Japan, Paris and London. Amy's also dedicated to helping people realize that they, too, are creative. "Nothing inspires me more than working with a person who says, 'I can't do it,' and then having them recognize that not only can they do it, but they can do a good job! "I intend to continue making a difference for others in this way," she said, "though I'm not clear what avenue it will take." E-mail Amy at amychris3@attbi.com, and check out her Web site. You can reach Kathy at kanderson138@attbi.com, and draw on other Sketch Pads.